In Partial Recall, twelve Native American artists and writers look deep into the images that have shaped our ideas of “Indianness,” and explore the complex relationship of photography to identity. For this volume, edited and introduced by Lucy R. Lippard, each contributor has chosen one or two photographs as the point of departure for their original poetic, historical, political, or autobiographical essays. From family-album snapshots to archival images (a top-hatted Geronimo at the wheel of a car, a nineteenth-century Indian School football team, two young women in Victorian dress on a “fainting couch”), the authors pursue the unexpected as they reveal the sometimes humorous, sometimes disturbing role of images in the relationships of native and nonnative peoples during the last century. 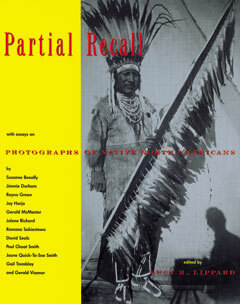 With an additional portfolio of more than sixty photographs drawn from around the country, Partial Recall is a unique and valuable anthology.